A couple of weeks ago, my Beloved and I celebrated our 5th wedding anniversary….and to celebrate, we decided to head to New York. We managed to talk our dear friends Tommy and Austin into going with us; they have been there, literally a dozen times and we figured they’d be good tour guides. We flew down on Porter on the Friday and came back on the Monday….and the 72 hours in between saw us pack an awful lot of activity into a very short time frame. And there was walking. So…much….walking. I joked that I really wished I had thought to bring a pedometer just to track how far we walked. I knit VERY little on my travel sock, which I specifically cast on for the occasion. Travel Sock on bamboo needles…JUST in case! Attractions included the Empire State Building, the Museum of Modern Art (Van Gogh’s Starry Night – SQUEE! ), the Staten Island Ferry/the Statue of Liberty, and of course Times Square. We ate at great restaurants, and saw two separate shows: Chicago on Broadway, and an immersive theatre event called Sleep No More, which left us all wondering how to get stage blood out of our white clothes…but I digress. 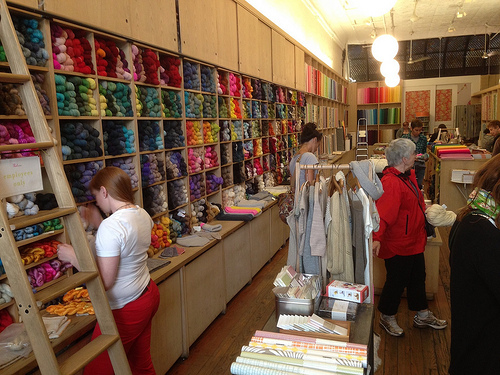 And of course, what knitter’s visit to New York is complete without a pilgrimage to Soho…the home of the famous LYS, Purl Soho? Sunday afternoon, I had half expected the place to be insane. I had read reviews that said the store was too small, and that the staff was uncaring and worse, downright rude, but I went anyway. The reviews could not have been more wrong. The store, while not huge was a great size…and the staff was downright delightful. Several asked if I needed assistance, and when I was not sure which colours to choose, they were more than happy to help me decide. I did get some lovely yarn: an indie dyer out of the US called Anzula, and some special Purl Soho bulky yarn that will be used to make a Bandana cowl…for me this time. 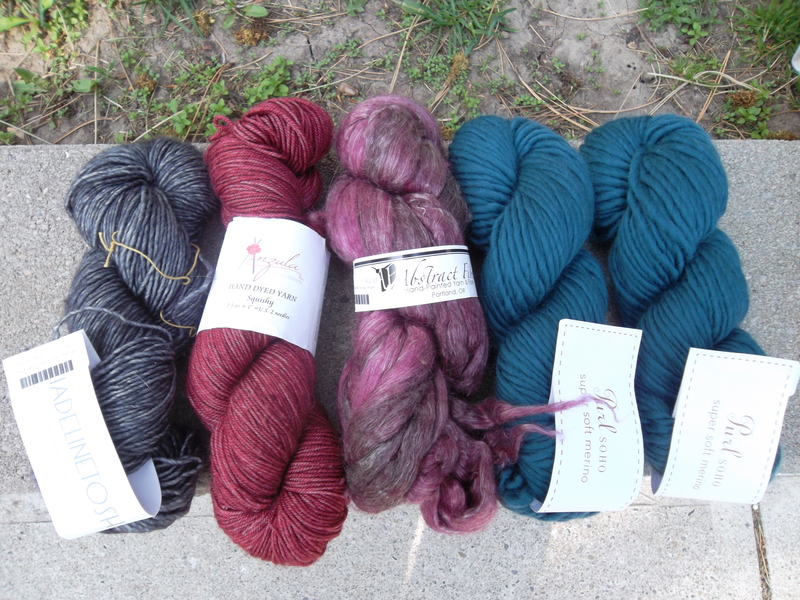 Also picked up some MadTosh DK for a hat for hubby…and some merino/tencel fibre for my friend, Val (in exchange for some needles she picked up for me on a recent trip south of the border). And I could not resist a few little notions and souvenirs. 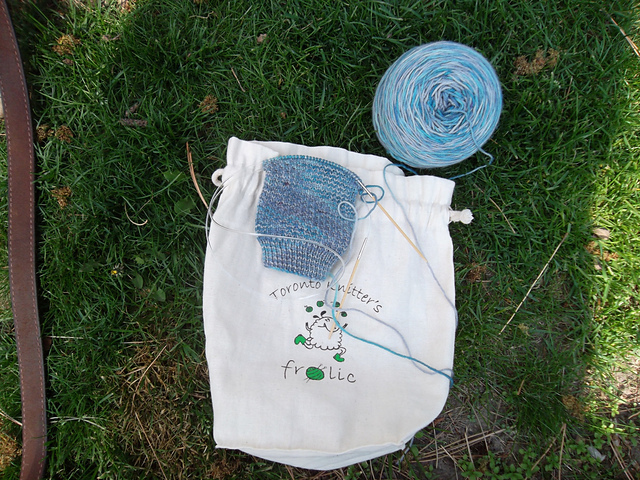 Purl Soho notions – including the requisite project bag! I liked New York just fine…but I do think it falls under the heading of “Nice place to visit but I wouldn’t want to live there!”. Paris, on the other hand, is an entirely different story altogether…. 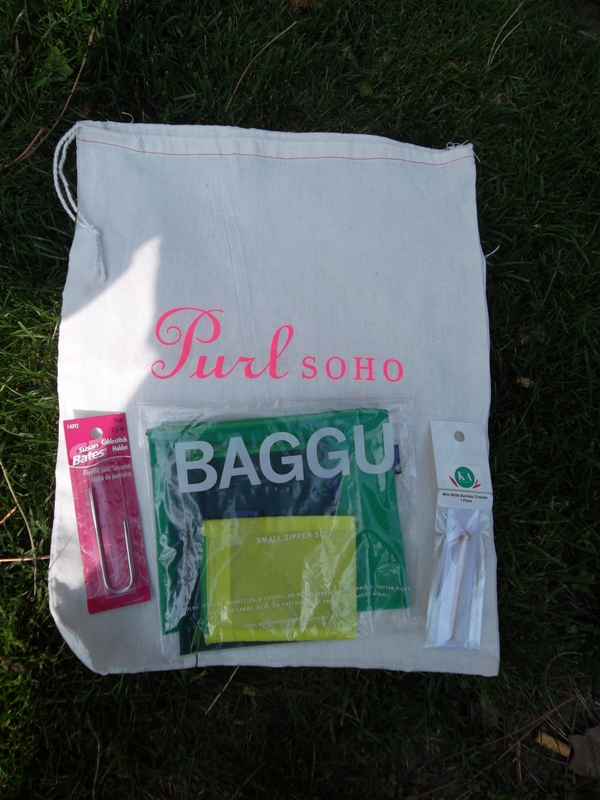 This entry was posted in Uncategorized and tagged nyc, purlsoho by Rayna. Bookmark the permalink.